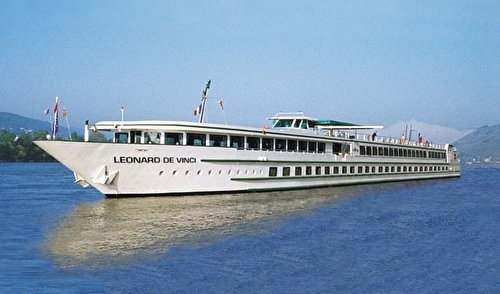 The MS Léonard de Vinci sails on the Rhine River and its tributaries. Down the Rhine River, stopover each and every country on the way. From Amsterdam to Strasbourg, you will see many extraordinary culturally rich cities and finish off your journey in picturesque Alsace – hometown of CroisiEurope, just at the right time for grape-harvest. Lounge-bar with a dance floor - bar - dining room - large sundeck with deckchairs - gift shop. Central heating, 220V electricity, air-conditioning, radar, radiophone, Wi-Fi on board. 6 night cruise sailing from Strasbourg aboard the MS Leonard De Vinci. 4 night cruise sailing from Strasbourg aboard the MS Leonard De Vinci. 8 night cruise sailing from Strasbourg aboard the MS Leonard De Vinci. 3 night cruise sailing from Strasbourg aboard the MS Leonard De Vinci. Main deck 2 beds - Suite Spacious and comfortable suite with two single beds, with bathroom (washbasin, shower and private toilet, towels provided), hair dryer, satellite TV, safe and radio. Located at the main deck, it offers a panoramic view of the landscapes.